Bitcoin has enjoyed an extraordinary surge in both value and public attention recently. 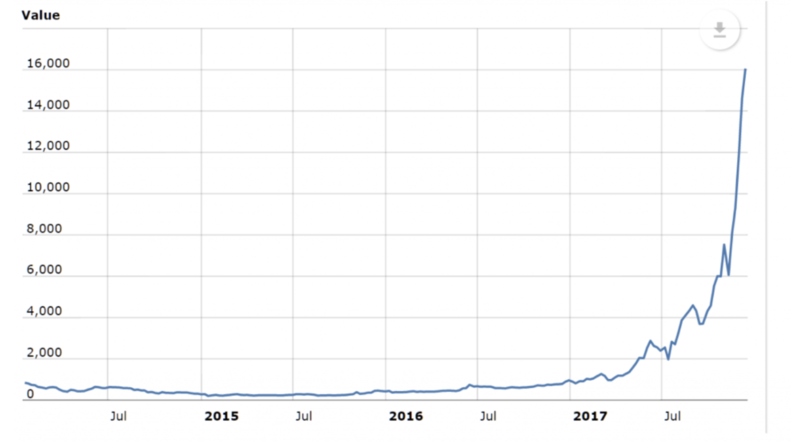 The chart below maps the rise in the price of a Bitcoin in USD over the last few years, and a similar chart could probably be plotted for the number of column inches, the number of internet searches and the number of experts confidently proclaiming it to be either a speculative bubble, or the gold of the future. The strong divergence of views is a particularly interesting feature of Bitcoin. Most commentators seem to fall firmly into one of the two main camps: the camp that says it is an obvious speculative bubble that will surely end badly, and the camp that says it is the global currency and store of value of the future, with considerable scope for further price appreciation. There doesn’t seem to be much middle ground – the equivalent of a broker “Hold” call. Clearly Bitcoin isn’t amenable to valuation in the way a company or bond is – it doesn’t produce any cashflows on which to ground an estimate of intrinsic value, and so discounted cashflow techniques point to a value of zero. However, that doesn’t mean that we should ascribe zero value to it. In this regard, better analogues can probably be found in currencies or gold, which derive their value from utility rather than from cashflows. Thought about in these terms, Bitcoin is a fascinating phenomenon, whose value is probably a function of the extent to which it is – or becomes – widely trusted and used as a unit of exchange. So, it’s informative to think about it terms of the likelihood of that happening, and the implications if it does. We can set out a simple framework that contemplates two extreme scenarios: one scenario in which Bitcoin fails to gain mainstream adoption, in which case its value falls to somewhere in the region of zero; and a second scenario in which Bitcoin becomes a universal currency and store of value. For the second scenario we might draw comparisons with the aggregate value of existing major currencies and of gold, which gives us numbers in the order of US$1.4 trillion for the case of the US dollar, and around US$7 trillion in the case of gold. Taking an average of these, we could adopt a high scenario aggregate valuation of $4.2 trillion. This is the aggregate value we might expect Bitcoin to represent in a world where it becomes a legitimate alternative to US dollars or gold. There are currently around 16.7 million Bitcoins in circulation, and the hard limit to the number that can be created is 21 million, which gets us to a value per Bitcoin of around US$200,000. We can then arrive at an indication of the “correct” price for a Bitcoin today by multiplying this high case number by the probability of the high case scenario eventuating. Obviously, there are different scenarios and end-point values that can be constructed, but based on these simple numbers, we can calculate that the current trading price of around US$17,000 implies a probability of the high scenario in the order of 10 per cent. If you believe that the likelihood of this scenario emerging over time is greater than 10 per cent, you may well be justified in buying Bitcoin at the current price. While it is not yet widely accepted, the number of bitcoin transactions and accepting parties appears to be growing steadily, as attention and awareness. It may be hard for people to fully trust a cryptocurrency in the way they trust physical gold or US dollars. There are many other considerations to take into account, as well as some Bitcoin myths that may need to be dispelled over time, but to my mind these are some of the more important issues. How you balance these sorts of considerations is a matter for personal judgement, but it strikes me that neither the “bubble” camp nor the “future gold” camp currently has a convincing case. There is clearly a good chance that Bitcoin implodes (and that should tell you something about how much exposure you want to have), but there is also some probability that it has a bright future, and that probability may well be enough to make sense of the current price. To summarise, while the exponential growth in the price of a Bitcoin looks ridiculous, and it would be tempting to call “bah humbug” on this one, I’m just not sure that we can. If the end-point is a reasonably significant valuation, and the starting point is close to zero, then getting from the starting point to the end-point will naturally involve some eye-watering growth and extreme volatility. Great article Tim, a genuinely balanced view! I'm not sure I agree that Bitcoin could ever become a gold/usd alternative in its current form. Personally, I would ascribe a very low probability to this i.e. less than 1%. The main reason for this is the amount of power that mining would end up consuming. Current estimates stand at around 37TWh of power consumption per annum. At the current rate of increase, Bitcoin mining would consume the entire world's in a few years time. The amount of carbon dioxide this is producing is scary - the estimates I've seen suggest over 100kg of CO2 per transaction is produced. These are only estimates based on asssumptions, so should be taken with a grain of salt, but I think it's a serious issue that's worth considering. as the mining, and associated ever increasing power requirement for each successive block of transactions, appear critical to preventing fraudulent transactions I guess, as is often the case, the strength of the system is indeed it's greatest weakness. Perhaps another of its crypto currency stablemates does not have this issue. Bitcoin mining is only economic while the cost of mining a bitcoin is less than its value. The cost will increase as more and more of the remaining 4.3m yet-to-be-found bitcoins are discovered so that the hard limit of 21m may never be reached. I think a more likely scenario is that only 17m - 18m will ever be mined.